He was lost, but never forgotten. A 19-year-old Army private among hundreds of thousands who fell in the Somme in World War I. For the past 90 years, his resting place has been carefully tended by the Commonwealth War Graves Commission. But there were no family flowers at Harry Burley's headstone. No relatives came to visit. On 21 November, after 20 years trying to find out what happened to his great uncle during World War I, John Evans, from Milton Keynes, solved the mystery caused by a spelling mistake with his name. John Harry Burley was 18 when he joined up. During his training, in a letter home to his mother in Cornwall, he wrote: "Dear Mother. They are making a big battalion. It is a thousand strong and when it is full we may get to France on garrison duty. It is not a dangerous job." Brave words, or maybe just a comfort to his mother. At any rate, the Somme region of France was already synonymous with slaughter. It was where Mr Burley would die, blown up on 21 March 1918, but all that came home was a blood-stained pay book found on the battlefield by comrades from the Durham Light Infantry. At his home in Bletchley, 62-year-old Mr Evans has always puzzled over conflicting evidence. The family had been told Mr Burley was blown to pieces so there was no grave, but he wondered why the documents on his body were returned. 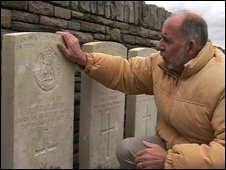 After 20 years the breakthrough came when staff at the Commonwealth War Graves Commission checked for the name Burley under the different spelling, Burleigh, and the pieces fell into place. Mr Evans found more conflicting evidence. Some of the letters home were addressed to Mrs Burley, but others were signed H Burleigh. Then Mr Evans sent off for Mr Burley's birth certificate in the name Burleigh but his father could not read or write so just made a mark on the certificate, so when the registrar searched for Burleigh, the error was not spotted. Finally, Mr Evans made the pilgrimage from Bletchley to a tiny cemetery in France near Arras called Vaulx Hill. Mr Burley's temporary grave there had been retaken by the Germans in the spring offensive of 1918 and destroyed, but a new headstone was erected after the war close to the spot where he had been originally buried. "I always believed Harry was somewhere, but I was told he was blown to pieces. "With all the information I had, I strongly believed he was there somewhere and it was for me to find him. "To think I have done it. I have found it after all these years. It has been a long journey. It touches me what a terrible waste." At his great uncle's headstone, he has left a wreath and a note. It reads: "Dearest Harry, handsome. Sorry it has taken so long to find you… never be lost again."